2019 Bisons ticket packages now available! 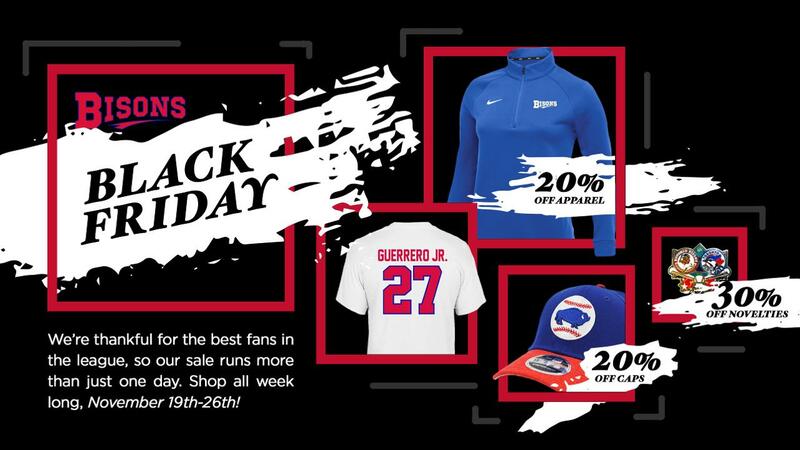 Home / baseball / black friday / Buffalo / Buffalo Bisons / CM / MiLB / sale / Sports / Bison's "Black Friday Week" is back with 20% off apparel/caps through Sunday! Bison's "Black Friday Week" is back with 20% off apparel/caps through Sunday! The online shop at Bisons.com is always open, so why would we limit our 'Black Friday' sale to just one day? The 'Black Friday WEEK' sale also means there's no minimums to order and no promo code needed. Just shop and stock up on savings during this one-week event! Looking for even more savings and a way to get your favorite baseball fan back to the ballpark? Bisons Holiday Packs are back with three great options to choose from with savings up to 66% OFF regular prices. Bisons Holiday Packs include tickets to Opening Day 2019 at Sahlen Field, undated flex tickets that can be used for their favorite promotion, even Star War Night, AND a Vladimir Guerrero Jr. jersey ornament. From there, you pick the merchandise item that best fits your favorite fan; there's a 150-piece Logo Puzzle for the kids or a Bisons logo Golf Set (towel, iron brush, golf balls) for the weekend hacker. Or, choose the Ultimate Opening Day Survival Kit, complete with blanket, tote, poncho and sunglasses.